white noise. | everything will turn out alright. really, sylvie? that’s all it takes for you to sleep more, nurse better, and stop fussing? my old white noise machine? REALLY? this white noise machine deserves a medal of honor for its tour of duty. when i lived in baltimore it drowned out the drunk college kids, the adolescent dirt bike gangs, and the occasional gun shot or two. now it calms my colicky baby. talk about range! this morning sylvie nursed for twenty minutes without grunting and pushing me away. she hasn’t nursed this well in almost a week. travis turned the white noise machine off for a second during this nursing session. she immediately began to fuss, grunt, and push my breast away. he turned it back on and she calmed down and ate normally. i guess we’ll be listening to a rain storm for a little while around here. in addition to this gift from god (or bed bath and beyond), we also purchased a maya wrap ring sling yesterday. she LOVES this carrier. she slept in it for almost two hours yesterday while i used both of my hands (what a novelty!) to do some dishes and make myself dinner. i can’t wait to take her for a walk in it! the maya wrap brings her carrier total up to THREE. she is still a little small and lacks the head control for the baby bjorn. i’ve tried to use the moby wrap several times, but i can never seem to get it right. it doesn’t feel tight enough or something. any advice on that? for now this sling seems to be what works. plus, look at all of those colors! she loves the tummy to tummy position it in. i love the nursing position and that it doubles as a nursing cover. i sense many walks around the park in our immediate future. 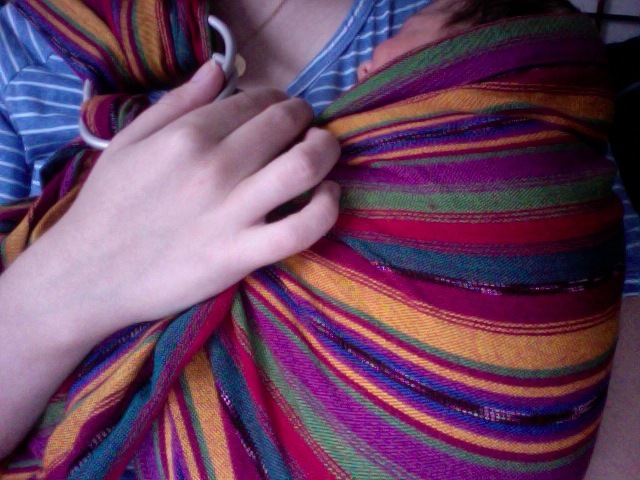 This entry was posted in Uncategorized and tagged baby wearing, colic, maya wrap, white noise. Bookmark the permalink. I absolutely adore that sling. Oh I hope I can get one in Australia. It’s tough to find the right carrier when they’re tiny. We had the New Native sling, but I was always worried that her head was too far forward and that she couldn’t breath well. But yeah, the Bjorn always seems like there head is too floppy. I’m hoping if we have another that the infant insert for the Ergo works well. this sling is great! she sort of sits up in it tummy to tummy. i never worried about her breathing. we both love it! Yeah, I have three different carriers too..the first one sat so low it banged my hips…guess it was made for the 6 foot tall model type on the box! The second one was okay..it worked but like Alicia I felt like his head was too far foward, although it wasn’t one of the ones that recalled for that. I did use our Baby Bjorn after a few weeks, but LP was bigger than Sylvie by then and always had a weirdly strong neck..he loved it, especially when he started facing outward and could see everyone. I love Alicia’s Ergo..it looks really comfortable…I think I might try a ring style and the Ergo if we have another one. Babies and “the Wire” gunshots? Who would have thought that one machine is such a multi-tasker! AB would be so proud. Cannot wait until Friday! If you can swingit, I HIGHLY recommend either an Ergo or bEco carrier. They are similar and I love them both so much (although my little Campbell is MUCH more partial to the Ergo… my other two kiddos likes the bEco more). I truely think that they both win hands down compared to a Bjorn — and daddys really like them too, and look good carrying them! — which often is a draw to the Bjorn. The Ergo and bEco are great for newborn on up to toddler and really provide a lot of neck support in the beginning. You can also get an insert for them for the newborn newborn stage. They often have great deals on Ergo carriers on babysteals.com, but paying full price is so totally worth it!